Transthyretin (TTR) is a protein that functions as a transporter of thyroxine and retinol and is produced chiefly by the liver (> 95%), with additional production within the choroid plexus of the brain and the retinal pigment epithelium. However, it is also associated with the formation of amyloid fibrils, leading to TTR-related amyloidosis (ATTR), in which these fibril proteins are deposited into various organs and tissues, preferentially the nervous system and cardiac tissue, resulting in their inherent dysfunction. The presenting signs and symptoms in patients with ATTR are fairly nonspecific and often attributed to more common diseases affecting both the heart and the peripheral and autonomic nervous sytems. Physical examination findings in patients with ATTR depend on the organ involved, which is affected by the presence and genetic identity of a TTR variant. Symptoms consistent with HFpEF, along with concurrent peripheral/autonomic neuropathy, warrant consideration of ATTR as a diagnosis. A complete family history is of great value. All types of amyloidosis are diagnosed definitively on the basis of demonstration of Congo red binding material in a biopsy or autopsy specimen. Subcutaneous fat aspiration often provides sufficient tissue for diagnosing amyloid, as well as for further studies (eg, immunostaining). Biopsy of an organ with impaired function (eg, heart, GI tract) can definitively establish a cause-and-effect relationship between organ dysfunction and amyloid deposition. See the image below. Other tests include electrocardiography, nerve conduction studies, and genetic studies (eg, polymerase chain reaction, electrospray ionization mass spectrometry, single-strand conformation polymorphism analysis and/or direct sequencing). Patisiran and inotersen have been approved by the FDA for treatment of polyneuropathy caused by hereditary transthyretin-mediated amyloidosis (hATTR) in adults. Several other medications are under investigation, but liver transplant remains the gold standard. Diuretics are the mainstay of therapy for amyloid-related CHF, but must be used with caution due to the restrictive physiology involved. The amyloidoses are a wide range of diseases of secondary protein structure, in which a normally soluble protein forms insoluble extracellular fibril deposits, causing organ dysfunction. 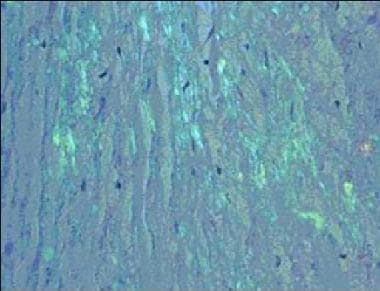 All types of amyloid contain a major fibril protein that defines the type of amyloid, plus minor components. Over 20 different fibril proteins have been described in human amyloidosis, each with a different clinical picture (see Amyloidosis, Overview). One such protein that forms human amyloid fibrils is transthyretin (TTR). TTR acts as a transport protein for thyroxine in plasma. TRR also transports retinol (vitamin A) through its association with the retinol-binding protein. It circulates as a tetramer of four identical subunits of 127 amino acids each. TTR was once called prealbumin because it migrates anodally to albumin on serum protein electrophoresis, but this name was misleading, as TTR is not a precursor of albumin. The TTR monomer contains eight antiparallel beta pleated sheet domains. The systemic amyloidoses are designated by a capital A (for amyloid) followed by the abbreviation for the chemical identity of the fibril protein. Thus, TTR amyloidosis is abbreviated ATTR. In contrast to variant ATTR, normal-sequence cardiac ATTR is associated with aging, usually developing in the seventh and eighth decades of life. This disorder is commonly of little or no clinical significance and only noted on autopsies in studies aiming at estimating its prevalance in an otherwise asymptomatic, aging population. In one autopsy study of people >85 years of age, ATTR was present in 25%. The fraction of autopsied patients with clinically significant symptoms is not known. The stimuli that lead to normal-sequence ATTR are not understood. Normal-sequence TTR forms cardiac amyloidosis predominantly in men above 60 years of age, a disorder termed senile cardiac amyloidosis (SCA). When it was recognized that SCA is often accompanied by microscopic deposits in many other organs, the alternative name senile systemic amyloidosis (SSA) was proposed. Both terms are now used. The clinical manifestations of severe SCA are similar to those observed in familial ATTR and in cardiac amyloidosis of the immunoglobulin light chain type (AL). ATTR is caused by a single-point mutation, of which more than 100 have been described, that promotes destabilazation of the native quarternary structure into beta-pleated sheet predominant, insoluble and inactive form. This conformational change hypothesis has been researched in vitro with a key finding that tetramer dissociation is a required and generally rate-limiting step in amyloid fibril formation. When the peripheral nerves are prominently affected, the disease is termed familial amyloidotic polyneuropathy (FAP). When the heart is involved heavily but the nerves are not, the disease is called familial amyloid cardiomyopathy (FAC). Cardiac ATTR amyloidosis has a progressive increase in prevalence in people older than 80 years and is seen in about 15% of autopsies, with one study finding a prevalence of about 25%. In this setting, the deposited TTR is usually of normal sequence (wt-ATTR). Currently, about 100 TTR variants are known, with varying geographic distributions, degrees of amyloidogenicity, and organ predisposition. Currently known TTR variants are listed in the table below. For organ involvement, the following abbreviations are used: PN = peripheral nerves, AN = autonomic nervous system, H = heart, L = liver, LM = leptomeninges, K = kidney, S = skin, E = eye, GI = gastrointestinal tract, CL = carpal ligament, and CNS = central nervous system. Variation in age of onset: The usual age of disease onset among TTR V30M gene carriers in Portugal, Brazil, and Japan is in the third to fourth decade of life. However, there are late-onset cases (as seen in Sweden) in which disease onset is in the fifth to sixth decade of life. Some patients with no family history of amyloidosis and asymptomatic relatives with the variant gene carry the V30M variant. Age of symptom onset is progressively earlier in successive generations. This feature is referred to as anticipation. Anticipation in some neurologic disorders is caused by expansion of trinucleotide repeats. However, in ATTR, this mechanism seems not to apply. TTR variants occur in all races. The age of onset varies widely, depending on the presence and identity of the TTR variant. Normal-sequence cardiac ATTR presents after age 60 years and usually after age 70 years. Variant-sequence ATTR presents in teenagers and people in their early 20s for the most aggressive variants and in people older than 50 years for many others. The average age of onset for ATTR V30M is 32 years in Japan and Portugal and 56 years in Sweden. The reason for this difference is not known. Ando Y, Nakamura M, Araki S. Transthyretin-related familial amyloidotic polyneuropathy. Arch Neurol. 2005 Jul. 62(7):1057-62. [Medline]. Ando Y, Suhr OB. Autonomic dysfunction in familial amyloidotic polyneuropathy (FAP). Amyloid. 1998 Dec. 5(4):288-300. [Medline]. Plante-Bordeneuve V, Lalu T, Misrahi M, et al. Genotypic-phenotypic variations in a series of 65 patients with familial amyloid polyneuropathy. Neurology. 1998 Sep. 51(3):708-14. [Medline]. Hagiwara K, Ochi H, Suzuki S, et al. Highly selective leptomeningeal amyloidosis with transthyretin variant Ala25Thr. Neurology. April 2009. 72:1358-60. [Medline]. Connors LH, Lim A, Prokaeva T, Roskens VA, Costello CE. Tabulation of human transthyretin (TTR) variants, 2003. Amyloid. 2003 Sep. 10(3):160-84. [Medline]. Tanskanen M, Peuralinna T, Polvikoski T, Notkola IL, Sulkava R, Hardy J, et al. Senile systemic amyloidosis affects 25% of the very aged and associates with genetic variation in alpha2-macroglobulin and tau: a population-based autopsy study. Ann Med. 2008. 40 (3):232-9. [Medline]. Zhen DB, Swiecicki PL, Zeldenrust SR, Dispenzieri A, Mauermann ML, Gertz MA. Frequencies and geographic distributions of genetic mutations in transthyretin- and non-transthyretin-related familial amyloidosis. Clin Genet. 2015 Oct. 88 (4):396-400. [Medline]. Bulawa C, Connelly S, DeVit M, et al. Tafamidis, a potent and selective transthyretin kinetic stabilizer that inhibits the amyloid cascade. PNAS. June 12, 2012. 109:9629-9634. [Medline]. Suhr OB, Svendsen IH, Andersson R, Danielsson A, Holmgren G, Ranløv PJ. Hereditary transthyretin amyloidosis from a Scandinavian perspective. J Intern Med. 2003 Sep. 254(3):225-35. [Medline]. Jacobson DR, Pastore RD, Yaghoubian R, et al. Variant-sequence transthyretin (isoleucine 122) in late-onset cardiac amyloidosis in black Americans. N Engl J Med. 1997 Feb 13. 336(7):466-73. [Medline]. Saraiva MJ, Birken S, Costa PP. Amyloid fibril protein in familial amyloidotic polyneuropathy, Portuguese type. Definition of molecular abnormality in transthyretin (prealbumin). J Clin Invest. 1984 Jul. 74(1):104-19. [Medline]. Jacobson DR, Buxbaum JN. Genetic aspects of amyloidosis. Adv Hum Genet. 1991. 20:69-123, 309-11. [Medline]. Benson MD. The hereditary amyloidoses. Best Pract Res Clin Rheumatol. December 2003. Volume 17, Issue 6:909–927. [Medline]. [Full Text]. Rapezzi C, Riva L, Quarta CC, Perugini E, Salvi F, Longhi S. Gender-related risk of myocardial involvement in systemic amyloidosis. Amyloid. 2008 Mar. 15(1):40-8. [Medline]. Adams D, Samuel D, Goulon-Goeau C, et al. The course and prognostic factors of familial amyloid polyneuropathy after liver transplantation. Brain. 2000 Jul. 123 (Pt 7):1495-504. [Medline]. Wange N, Anan I, Ericzon BG, Pennlert J, Pilebro B, Suhr OB, et al. Atrial Fibrillation and Central Nervous Complications in Liver Transplanted Hereditary Transthyretin Amyloidosis Patients. Transplantation. 2018 Feb. 102(2):e59-e66. [Medline]. [Full Text]. Rapezzi C, Perugini E, Salvi F, Grigioni F, Riva L, Cooke RM, et al. Phenotypic and genotypic heterogeneity in transthyretin-related cardiac amyloidosis: towards tailoring of therapeutic strategies?. Amyloid. 2006 Sep. 13(3):143-53. [Medline]. Adams D, Suhr OB, Hund E, Obici L, et al. First European consensus for diagnosis, management, and treatment of transthyretin familial amyloid polyneuropathy. Curr Opin Neurol. 2016. 29 (suppl1):S000-S000. [Medline]. Parman Y, Adams D, Obici L, et al. Sixty years of transthyretin familial amyloid polyneuropathy (TTR-FAP) in Europe: where are we now? A European network approach to defining the epidemiology and management patterns for TTR-FAP. Curr Opin Neurol. 2016. 29 (suppl 1):S000–S000. [Medline]. Phull P, Sanchorawala V, Connors LH, Doros G, Ruberg FL, Berk JL, et al. Monoclonal gammopathy of undetermined significance in systemic transthyretin amyloidosis (ATTR). Amyloid. 2018 Mar. 25(1):62-67. [Medline]. [Full Text]. Simmons Z, Specht, C. The Neuromuscular Manifestations of Amyloidosis. Journal of Clin Neuromuscular Dis. March 2010. 11:145-157. [Medline]. Gertz MA, Benson MD, Dyck PJ, et al. Diagnosis, Prognosis, and Therapy of Transthyretin Amyloidosis. J Am Coll Cardiol. 2015. 66:2451-66. [Medline]. Ando Y, Coelho T, Berk JL, Cruz MW, Ericzon BG, Ikeda S, et al. Guideline of transthyretin-related hereditary amyloidosis for clinicians. Orphanet Journal of Rare Diseases. 2013. v.8, 31:[Medline]. [Full Text]. Klaassen SHC, Tromp J, Nienhuis HLA, van der Meer P, van den Berg MP, Blokzijl H, et al. Frequency of and Prognostic Significance of Cardiac Involvement at Presentation in Hereditary Transthyretin-Derived Amyloidosis and the Value of N-Terminal Pro-B-Type Natriuretic Peptide. Am J Cardiol. 2018 Jan 1. 121(1):107-112. [Medline]. [Full Text]. Gertz MA, Dispenzieri A, Sher T. Pathophysiology and treatment of cardiac amyloidosis. Nat Rev Cardiol. 2015 Feb. 12 (2):91-102. [Medline]. Gillmore JD, Maurer MS, Falk RH, Merlini G, Damy T, Dispenzieri A, et al. Nonbiopsy Diagnosis of Cardiac Transthyretin Amyloidosis. Circulation. June 14, 2016. Volume 133, Issue 24:2404-2412. [Medline]. [Full Text]. Treglia G, Glaudemans AWJM, Bertagna F, Hazenberg BPC, Erba PA, Giubbini R, et al. Diagnostic accuracy of bone scintigraphy in the assessment of cardiac transthyretin-related amyloidosis: a bivariate meta-analysis. Eur J Nucl Med Mol Imaging. 2018 Oct. 45(11):1945-1955. [Medline]. [Full Text]. Rapezzi C, Merlini G, Quarta, C, et al. Systemic Cardiac Amyloidosis: Disease Profiles and Clnical Courses of the 3 Main Types. Circulation. Sep 2009. 120:1203-1212. [Medline]. Montagna P, Marchello L, Plasmati R, et al. Electromyographic findings in transthyretin (TTR)-related familial amyloid polyneuropathy (FAP). Electroencephalogr Clin Neurophysiol. 1996 Oct. 101(5):423-30. [Medline]. Planté-Bordeneuve V, Ferreira A, et al. Diagnostic pitfalls in sporadic transthyretin familial amyloid polyneuropathy. Neurology. Aug 2007. 69:693-698. [Medline]. Hawkins, P. N., Ando, Y., Dispenzeri, A., et al. Evolving landscape in the management of transthyretin amyloidosis. Annals of Medicine. 2015 Nov 17. 47(8):625–638. [Medline]. [Full Text]. Benson MD, Waddington-Cruz M, Berk JL, Polydefkis M, Dyck PJ, Wang AK1, et al. Inotersen Treatment for Patients with Hereditary Transthyretin Amyloidosis. N Engl J Med. 2018 Jul 5;. 379(1):22-31. [Medline]. [Full Text]. Cruz MW, Benson MD. A Review of Tafamidis for the Treatment of Transthyretin-Related Amyloidosis. Neurol Ther. 2015. 4:61-79. [Medline]. Waddington Cruz M, Amass L, Keohane D, Schwartz J, Li H, Gundapaneni B. Early intervention with tafamidis provides long- term (5.5-year) delay of neurologic progression in transthyretin hereditary amyloid polyneuropathy. Amyloid. 05 Aug 2016. Vol. 23 , Iss. 3:178-183. [Medline]. [Full Text]. Suhr OB, Larsson M, Ericzon B-G, Wilczek HE. Survival After Transplantation in Patients With Mutations Other Than Val30Met: Extracts From the FAP World Transplant Registry. Transplantation. 2015. 00:1-9. [Medline]. Berk JL, Suhr OB, Obici L, Sekijima Y, Zeldenrust SR, Yamashita T, et al. Repurposing diflunisal for familial amyloid polyneuropathy: a randomized clinical trial. JAMA. 2013 Dec 25. 310(24):2658-67. [Medline]. Anderson P. NSAID halts progression in familial amyloid polyneuropathy. December 30, 2013. Medscape Medical News. Available at http://www.medscape.com/viewarticle/818483. Accessed: January 10, 2017. Sant’Anna, R., Gallego, P., Robinson, L. Z., et al. Repositioning tolcapone as a potent inhibitor of transthyretin amyloidogenesis and associated cellular toxicity. Nature Communications. 2016 Feb 23. 7:[Medline]. [Full Text]. The Familial Amyloidotic Polyneuropathy World Transplant Registry. Available at http://www.fapwtr.org. February 29, 2016; Accessed: March 16, 2016. Ericzon B-G, Wilczek HE, Larsson M, et al. Liver transplantation for hereditary transthyretin amyloidosis: after 20 years still the best therapeutic alternative?. Transplantation. 2015. 99:1847-1854. [Medline]. Beirao JM, Maleiro J, Lemos C, Beirao I, Costa P, Torres P. Ophthalmological manifestations in hereditary transthyretin (ATTR V30M) carriers: a review of 513 cases. Amyloid. 2015. 22:117-122. [Medline]. aus dem Siepen F, Bauer R, Aurich M, Buss SJ, Steen H, Altland K, et al. Green tea extract as a treatment for patients with wild-type transthyretin amyloidosis: an observational study. Drug Design, Development and Therapy. 2015 Dec 4. v9:6319–6325. [Medline]. [Full Text]. Desai HV, Aronow WS, Peterson SJ, et al. Cardiac Amyloidosis: Approaches to Diagnosis and Management. Cardiology in Review. Jan 2010. 18:1-11. [Medline]. Ericzon BG, Larsson M, Herlenius G, Wilczek HE. Report from the Familial Amyloidotic Polyneuropathy World Transplant Registry (FAPWTR) and the Domino Liver Transplant Registry (DLTR). Amyloid. 2003 Aug. 10 Suppl 1:67-76. [Medline]. Damas AM, Saraiva MJ. Review: TTR amyloidosis-structural features leading to protein aggregation and their implications on therapeutic strategies. J Struct Biol. 2000 Jun. 130(2-3):290-9. [Medline]. Monteiro E, Freire A, Barroso E. Familial amyloid polyneuropathy and liver transplantation. J Hepatol. 2004 Aug. 41(2):188-94. [Medline]. Lauro A, Diago Usò T, Masetti M, Di Benedetto F, Cautero N, De Ruvo N, et al. Liver transplantation for familial amyloid polyneuropathy non-VAL30MET variants: are cardiac complications influenced by prophylactic pacing and immunosuppressive weaning?. Transplant Proc. 2005 Jun. 37(5):2214-20. [Medline]. Klabunde T, Petrassi HM, Oza VB, et al. Rational design of potent human transthyretin amyloid disease inhibitors. Nat Struct Biol. 2000 Apr. 7(4):312-21. [Medline]. Tojo K, Sekijima Y, Kelly JW, et al. Diflunisal stabilizes familial amyloid polyneuropathy-associated transthyretin variant tetramers in serum against dissociation required for amyloidogenesis. Neurosci Res. 2006. 56:441-449. [Medline]. Palha JA, Ballinari D, Amboldi N, Cardoso I, Fernandes R, Bellotti V, et al. 4'-Iodo-4'-deoxydoxorubicin disrupts the fibrillar structure of transthyretin amyloid. Am J Pathol. 2000 Jun. 156(6):1919-25. [Medline]. Peterson SA, Klabunde T, Lashuel HA, et al. Inhibiting transthyretin conformational changes that lead to amyloid fibril formation. Proc Natl Acad Sci U S A. 1998 Oct 27. 95(22):12956-60. [Medline]. Saraiva MJ. Transthyretin amyloidosis: a tale of weak interactions. FEBS Lett. 2001 Jun 8. 498(2-3):201-3. [Medline]. Suhr OB, Herlenius G, Friman S. Liver transplantation for hereditary transthyretin amyloidosis. Liver Transpl. 2000 May. 6(3):263-76. [Medline].